We love our dogs so much that we hate seeing them falling sick or in pain. And despite doing all we can, they somehow manage to get injured or fall ill. Injuries are never good and some of them can even be very fatal. One such type of injuries affecting dogs is the Cranial Cruciate Ligament (CCL) injury which is very similar to the Anterior Cruciate Ligament (ACL) injury in humans. So what exactly is the CCL injury? The Cranial Cruciate Ligament (CCL) is a hard or tough band of tissues that links the two major bones of the knee joint. It attaches the femur (upper bone) to the tibia (lower bone) and aids in preventing constant motion between these two bones. The most common ligament injury is a ruptured CCL and this can be very painful. If not treated immediately, it may lead to progressive arthritis. So what do we call it – ACL or CCL injury? Generally, ACL is associated with humans which connects tissues from the thighbone to the shinbone at the knee while the CCL is similar and connects the back of the femur to the front of the tibia. 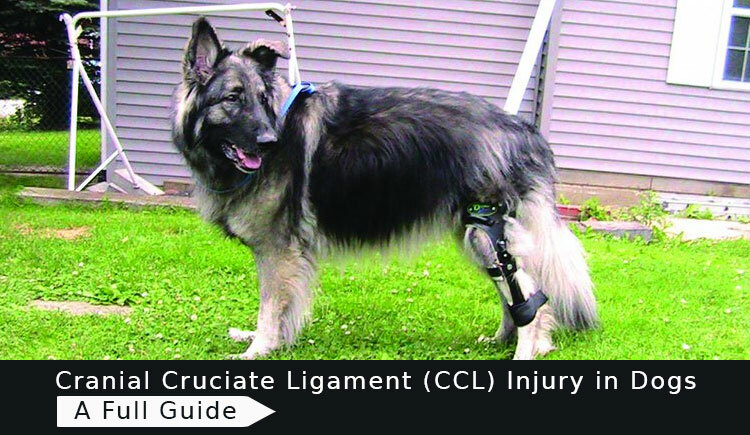 You will notice vets using ACL and CCL interchangeably because humans are well acquainted with the term ACL and perhaps may have even experienced such injury. Which dog breed is more likely to get a CCL injury? To tell you the truth, every dog breed can acquire a CCL injury but the following breeds are more likely to get one. What are the symptoms for CCL injury? Detecting the injury early is very crucial. Hence, the following symptoms will assist you in this regard. How to treat a torn CCL or ACL? The most common treatment method is by surgery, although in some cases surgery alone is not enough to treat CCL injury. You can also opt for other treatment methods because surgery may well be expensive. Oral treatment like pain relievers. To go with the above, ensure your pet gets ample rest. Keeping your dog’s weight under check and protecting him using preventative methods can go a long way in lowering the risk of a CCL or ACL injury. Thus, as pet parent take necessary precautions because as you know, prevention is always better than cure.